I am very pleased to say that this photograph by Stephen Riley Photography will appear in the February 2014 edition of Architecture Today, as part of an advertisement for ALUCOBOND® Composites. 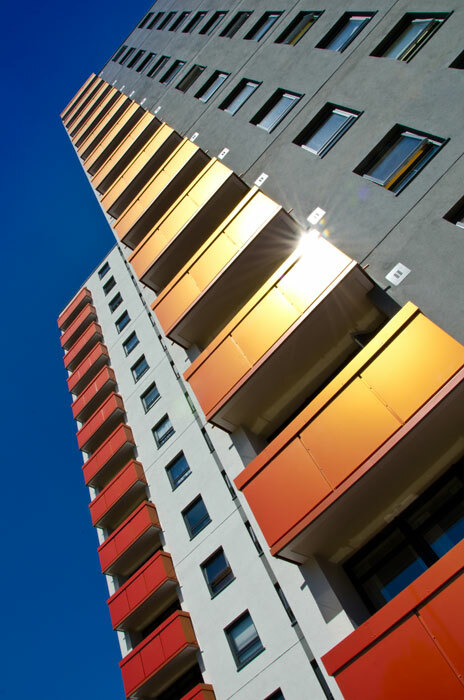 The photoshoot, commissioned by JWD Architectural Aluminium, of Hyde, Cheshire, features a redevelopment project called ‘Blackfriars Court’, in Salford, Greater Manchester, UK. The scheme was completed in 2013 and comprises the complete refurbishment of a run-down 1960s former council housing block, including external wall insulation, radical aesthetic changes and an overall raising of the quality of the structure to 21st century specifications. The key new visual feature – the striking two-tone metallic balcony covers – were made by JWD from ALUCOBOND composite cladding on a computerised cutting machine. The boost in morale that these improvements have brought to residents in this once unglamorous bit of inner city has resulted in their taking a proprietorial position and developing their own garden project around the base of the building. The combination of this and the radical redefining of the quality and appearance of the structure have resulted in an overall uplift in the atmosphere and esteem of the area. ALUCOBOND has bases all over the world. Its 'local' (European) one is in Singen in Germany.